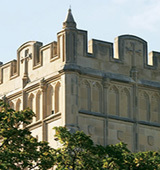 Mount Mary College is a Roman Catholic liberal arts college for women in Milwaukee. Mount Mary enrolls about 1,702 students and offers a variety of pre-professional and professional programs. On campus, check out Mount Mary's extensive special collection of historic costumes. What are the top 3 reasons someone should attend Mount Mary University? Small class sizes, woman only school, and high involvement are the top reasons someone should attend Mount Mary University. What is a typical Mount Mary University student like? Describe the type of person that should attend Mount Mary University. There is no such thing as a typical student, everyone is unique and different. Mount Mary University loves the diversity and uniqueness that everyone brings. Mount Mary University is a place where young women discover their talents, their strengths, and their career and personal interests. Mount Mary's strong academic reputation is built on nearly a century of preparing confident and successful women for fulfilling careers and for life. The University's dedicated and student-centered faculty bring real-world experience to the classroom and are energized by the success of their students. Our promise is to provide a high quality education and the opportunities students need to transform the world. Mount Mary University, an urban Catholic university for women, sponsored by the School Sisters of Notre Dame, provides an environment for the development of the whole person. The University encourages leadership, integrity, and a deep sense of social justice arising from a sensitivity to moral values and Christian principles. Mount Mary commits itself to excellence in teaching and learning with an emphasis on thinking critically and creatively. The baccalaureate curriculum integrates the liberal arts with career preparation for women of diverse ages and personal circumstances; the programs at the graduate level provide opportunities for both men and women to enhance their professional excellence. What are the top 3 things that students do for fun at Mount Mary University? The top 3 things that students do for fun at Mount Mary University include an orientation day that involves everyone at the university, playing sports, and become involved in many clubs and organizations. 62% of students received Pell Grants, which are provided by the U.S. government to students from middle and lower income families. It gives you an idea of a school’s socio-economic diversity. Campus housing is available for undergraduates. Housing deposit : $100.00. Housing deposit due : May 1. Housing deposit is not refunded if student does not enroll. Freshman allowed to have car. No pets. 16% of students live on-campus. Any instructional program in nuclear and industrial radiologic technologies not listed above. The average student pays $13,711 for tuition, fees, and other expenses, after grants and scholarships. Total stated tuition is $24,598, in-state and on-campus, before financial aid. Learn more about financial aid at http://mtmary.edu/financialaid/index.htm. Estimate the net price for you at http://www.mtmary.edu/financialaid/calculators.htm. The typical (median) early career salary of Mount Mary University graduates is $40,300, according to Payscale. Mount Mary University participates in the for college athletics. Want more info about Mount Mary University? Get free advice from education experts and Noodle community members.